These beautiful frogs have become a very popular pet species over the recent years. They are grass-green colored, usually with a creamy colored line running from the jaw along the flanks. (There are sometimes specimens who don't have this green line, but they are a very small proportion) It looks similar to its European cousin Hyla arboria, except that it is slighlty thinner and longer. 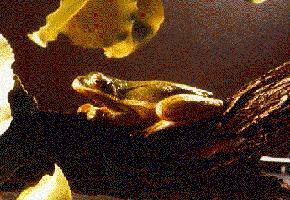 Green tree frogs can be housed in a large, unheated vivarium, out of direct sunlight. You may also want to get them a flourescent tube for localized heat which apparently they like to hang out on for hours. The temperature should generally be maintained between 20 and 25�C (68-77�F) during the summer, and a bit cooler in the winter. This species seems to do really well in captivity provided they didnt get too jolted in shipping. Apparently these guys often arrive in pet stores in such bad shape that even the most tender loving care won't save them. However, if you got one in good shape, they are really pretty hardy creatures. Males make a really loud noise thats a bit like quacking, which is sometimes known as a "rain call" because they tend to make a lot of noise after warm noises, but which can also be stimulated by external noises. This photo provided courtesy of: J.S. Rozum, University of Arizona.